Asbestos is a mineral fiber that is used in a variety of building construction materials for insulation. Asbestos may be found in materials such as roofing, shingles, ceilings, floor tiles, and cement products, due to its heat-resistant properties and fiber strength. It is also used in friction products, such as automobile brakes, clutches, and transmission parts, as well as in heat-resistant fabrics and coatings. When asbestos-containing materials are damaged or disturbed by repair, remodeling, or demolition activities, microscopic fibers may become airborne and inhaled directly into the lungs where they can cause significant health problems, including asbestosis, lung cancer, and mesothelioma. See, ATSDR Website. Unfortunately, persons exposed to asbestos fibers may not have manifested symptoms, or appear ill, until decades later. 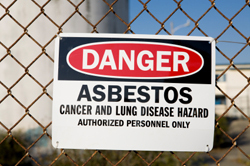 Victims of asbestosis, lung cancer, or mesothelioma may suffer years of illness, pain, suffering, and even death. If you, or a family member, have been exposed to asbestos and have developed asbestosis, lung cancer, or mesothelioma, call me to discuss your case.